I had the opportunity to review another fabulous store from CSN's 200+ stores. This time I chose ToysAndGamesOnline.com. I LOVE dealing with CSN-the stores are easy to navigate, the checkout process is effortless and the shipping (which on a lot of items is FREE) is super fast! There was another reason to get my puppet theater up and running, and it was done just in time to get all these cuties in the mail! 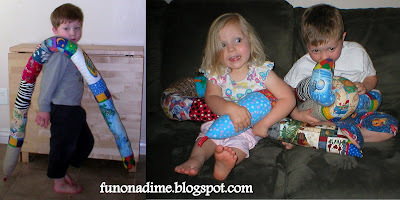 I love Melissa and Doug products, and these puppets are no different! They are great quality and I know they will just last and last! They all (excluding the monster and princess) have sticks to stick in their hand, which can put on quite a professional puppet show. My kids LOVE them...almost as much as I do. 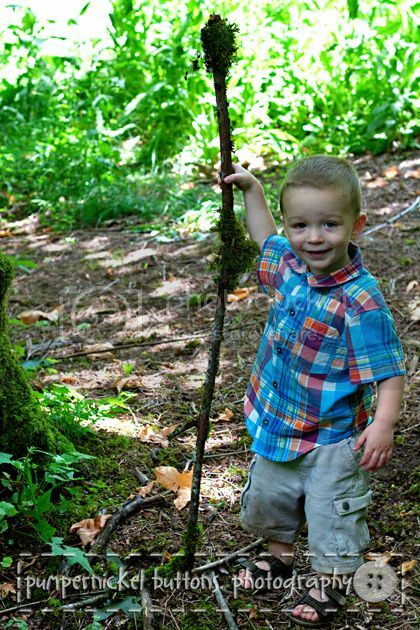 Nothing is better than a good quality toy that fosters imaginative play, and will last throughout all your kids. 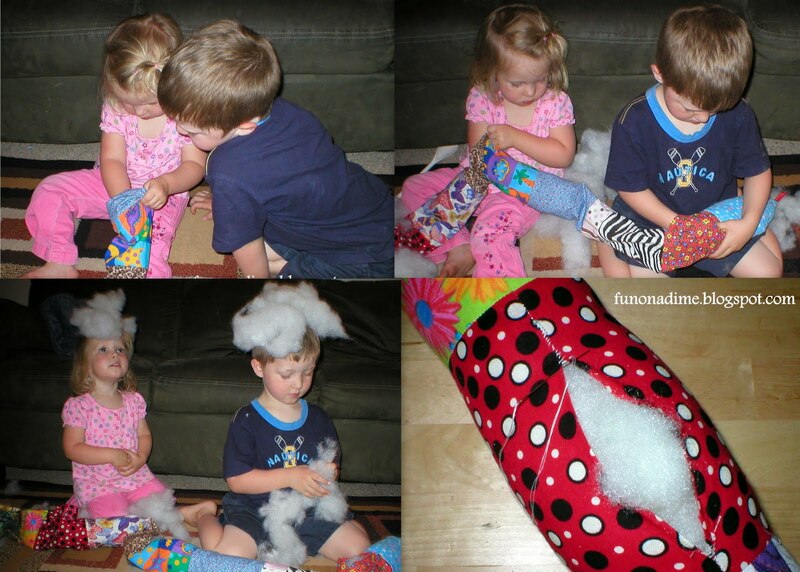 The make your own monster and princess kits are SO much fun, they each have one puppet that is just as good quality as the others, and then heavy duty velcro pieces and clothes to change their looks. The monster one is my favorite, there are over 30 pieces to create just about any kind of monster you can think of. My daughter loves changing the clothes and wigs on the princess and giggles herself silly when I keep her bald and make the puppet scream about her missing hair. We are all having way too much fun with these, and expect to keep having fun for years to come! Disclosure: I received no other compensation from CSN or Melissa & Doug other than these puppets. The opinions expressed are solely my own. If you are interested in contacting CSN stores to see if they want to do a review or giveaway with you-you can contact Jason at CSNPromoTeam at csnstores dot com. Hi my name is Michelle (aka the Fun On A Dime Lady) from Fun On A Dime. If you are looking for some inexpensive fun for the whole family, you should come over and check out the fun we are having. 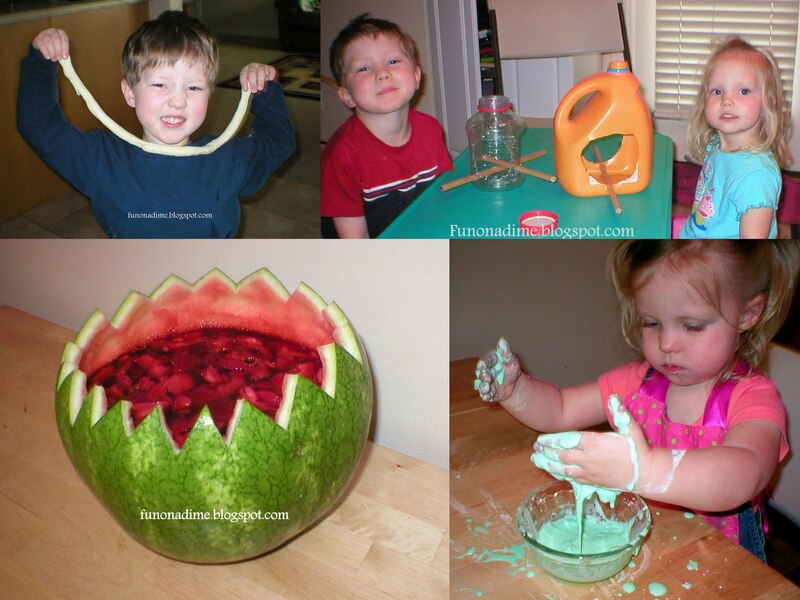 There are a lot of yummy recipes, crafts, games, and many more fun ideas to keep you and your children busy. Come join the fun! Today I wanted to share a creative gifting idea that used scrap fabric and other materials I had already on hand from previous projects. It was easy and ended up being a big success! I made this snake for my 4 year old son's birthday a few months ago and was surprised how much he liked it. In fact, my 2 year old daughter immediately started begging for one. When friends come over to play it is such a hit with them that I decided we couldn't wait until my daughter's birthday for her snake. This snake is so easy to make and it is a fun project that all ages can be involved in making it. 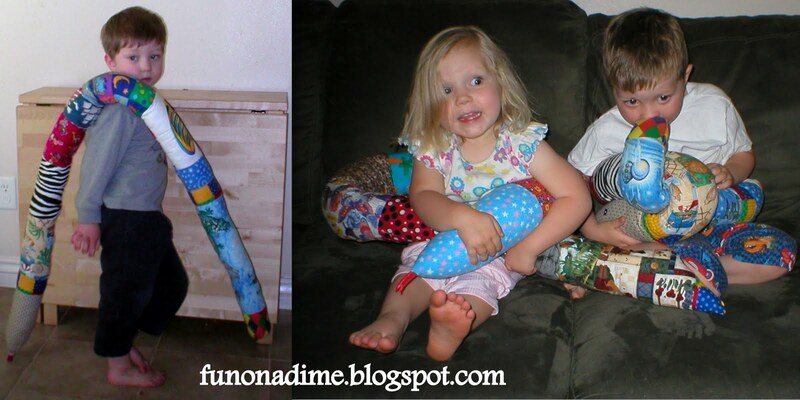 If you have a 10 or 11 year old, they could easily sew it, with supervision, of course! Step 1: Get out your scrap fabric and pick which pieces you would like to make the snake out of. They do not have to be color coordinated (unless you want it that way) and you can use a variety of textures. This is a Step that younger children can definitely participate in. I did not realize how picky my daughter was going to be...she said "no thank you" to all the really girly fabric! Step 2: Cut your fabric. Once your fabric is chosen, cut them into strips about 9 - 11 inches wide and however long you want. My strips were between 4 - 12 inches long. The width will be how round the snake is. A good idea is to aim for the width of your forearm. You can combine scraps together to create the desired width to make a cute patchwork look, but it is definitely easier to just keep it one fabric for the width and make each strip 6-12 inches long...but it is up to you how much time you want to spend! For the snake's head, cut desired fabric to width and length. Fold it in half (pattern side in) and trace a tear drop on one side. Then cut. Step 3: Time to create the length of your snake. Pin all your fabric together pattern sides facing each other (so your seams will be on the inside of the snake when you are done.) Then sew. A basic stitch is all you need. Step 4: Pull all your pins out. Little helpers are great for this, too. And once done you should have your length of your snake. You can still add more length if you decide you want it longer. 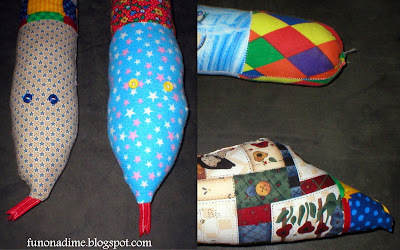 Step 5: To create the body of the snake, pin the fabric edges together, pattern side in, to create one long tube. Step 6: Prepare a tongue. Thread used for cross-stitching makes a great tongue (see below). Just loop it (usually it is 6-8 threads), so that it is 3 inches long. Tie it in a knot on the end that will be exposed. You can also use anything else you have to create the tongue. Get creative! I used some leftover binding, but debated on using a velcro strip I had. Once the tongue is ready, pin it so the knot or snake tongue V and the majority of the tongue length is on the pattern side of the snake. Leave 1/2 inch exposed (see below) so you can sew through it and secure it in place. Step 7: Sew your snake, BUT make sure to leave a 6-8 inch gap every 1.5 feet or so. This will allow you to stuff your snake easier in the next step. I had 4 gaps on my snake. Be sure to sew the tail up before you turn it inside out. I tapered mine off, but I probably could have made a V and it would look better (luckily, the kids don't notice! Step 8: Turn the snake inside out, stuff the snake, play with the stuffing (of course! ), and then stitch up your gap/holes by hand. Use the end of a long wooden spoon to push stuffing into places you can't reach (like the nose and tail). Stuff the snake until you have desired thickness. 16 oz of stuffing makes a very soft snake. I used about 25 oz, so that it was a bit thicker. Make sure you stitch the holes with a tight stitch. Step 9: Sew your button eyes on good and tight. I like to use a pencil to mark where I want them prior to sewing them on. Helpers do a great job at pulling the thread up! Step 10: Enjoy and have fun! They were so busy playing, it was hard to get them to sit still and make a normal face! This is a close up of the head and the tail. The top tail is what happened when I forgot to sew up the tail and did not realize it until it was stuffed! Stop by Fun On A Dime for more family fun! I'm having a Baby Shower and YOU get the gifts! And... I NEED your help! Since I am getting ready to have this cute little boy that keeps kicking me in the ribs in September, I decided it's time to have a baby shower! You'll be the ones getting the gifts though! Yeah! August 31st-Sept 3rd I will have lots of things to giveaway! Be sure to put Baby Shower in the subject line! To remind yourself of all the fun, feel free to grab a button to post on your blog! Also, I am going to be needing some help for my maternity leave which will start the week after the baby shower and go through the second week of October.If you would be willing to do a guest post please contact me! Be sure to put Maternity Leave in the Subject line, and let me know what day of the week you would like to post on...Tuesday, Wednesday, Thursday or Friday-read on to see which will work best for you. Here is what I'll be needing-Mondays-Making the World Cuter Mondays-no guest posts needed, I will have those all set up and ready to go! :)Tuesdays-TutorialsWednesdays-RecipesThursdays & Fridays-Show us how you make the world cuter! EDIT-I am filling up quickly-so thank you!!! I have 3 Wednesdays left, 2 Thursdays, and 4 Fridays as of Thursday afternoon. Blog Swappers Wanted for August! Just looked at my calendar and realized I have no swaps for August set up (because I am a slacker and haven't been looking ahead). Anyone want to swap a Friday in August for Friendly Fridays? All filled up! Thanks everyone who contacted me so quickly! OH and I totally spaced choosing a winner for this weeks giveaway on Monday for the super cute iPod cozy from My Junk Drawer! The winner is #32 from The Hand Me Down House-who made these FANTASTIC vases out of Snapple bottles! Go check them out, they are really beautiful. I have been wanting to make my kids a puppet theater forever, but I have just never found the right piece of furniture to turn into one. So I decided to build one myself. (with help from my husband of course, but I did do a lot of it, if not most of it myself). Now it drives my hubby crazy but I don't ever start out anything with a plan, just an idea in my head and then I just make it work. I went through our scrap wood-found 3 pieces of wood that were all the same size for the top, middle and bottom and then I cut a 2x3 (I think) in half. I measured the 2x3's width, doubled it and cut that much off of the middle board so that it would fit between the two pieces of wood and then screwed it all together. Here is the side view, you can see I just drilled screws in the top and bottom pieces down into the posts and then through the side of the post to attach the middle piece. Pretty easy...if you can just get those darn screws started! :) Then I painted it white...well the first coat anyway, my hubs finished the painting process for me, one because I am not a patient person when it comes to painting and two because my finger hurt after the first coat! :) We went back and forth for a day or two, trying to decide how to stable it, we thought of a sort of a-frame brace, some sort of hinged brace that would fold up for easy storage and finally settled on the easiest brace of all. Just a small piece of wood screwed into the bottom of the theater on each side. This also presents the least amount of opportunity for kids to trip over it. So that I could hang this little bag on the back of the stage to house the "performers" in between shows. I was planning on making a bag out of the same red fabric with little loops and buttons to hold it on-but after the curtains, I quickly abandoned that idea. I found this old pillow sham, sewed the shorter side over to make a loop and it was ready to go as a bag. Easy and free! Lastly I had my hubby cut a piece of wood to fit along the bottom, screwed that to the base... then I quickly painted it with my handy dandy chalkboard paint and let the kids at it. They are ecstatic to say the least, and have already come up with a few more uses for it than just a puppet stage. Bekah has been a princess at the top of a tower waiting for a knight to save her, and Christopher has been using it as his house, and will look out the window to see if his friends are ready to play. Of course, we've had many a puppet show, or more like puppet giggle shows as well. I'm pretty excited about it too-we used mostly what we had on hand and only had to buy a couple extra cans of white spray paint and the fabric for the curtains. Linking to some of these great parties. I can't wait to see what you've all been up to this week! Everyone who links up today will be automatically entered to win a fantastic prize from My Junk Drawer! EDIT: Contest Closed! Hello everyone! This is Kristen from My Junk Drawer. I am so happy to be able to host a fun giveaway today. One lucky winner will receive one of these cuties to store your iPhone or iTouch in. This sleeve/case is 5"x3.5", is lined with batting to help against cracks, and has a loop closure to hold your device in. I hope that whichever one of you awesome readers gets this, enjoys it! I can't believe how fast this week has flown by-actually this summer, it is pretty much the end of July now! Where did it all go? What has been going on in your world this last week? Mine has been filled with appointments, playing outside with my kids, anti-potty training, feeling hot and fat, lots of feeding, petting and even riding horses, and a little bit of going through pictures....Finally! #1-I finished picking and editing the pictures I took of Porter for his 2 year old birthday, I really tried to focus on the ones that would remind me of how he is right now, rather than ones I would usually want framed-he is changing so fast! From baby to child in the blink of any eye. His pictures are here. #2-My second thing that stands out this week is also about Porter. We were outside, because we have been trying to keep him outside while he is underwear unless he is in the bathroom for obvious reasons, and Bekah pointed out the moon to him. 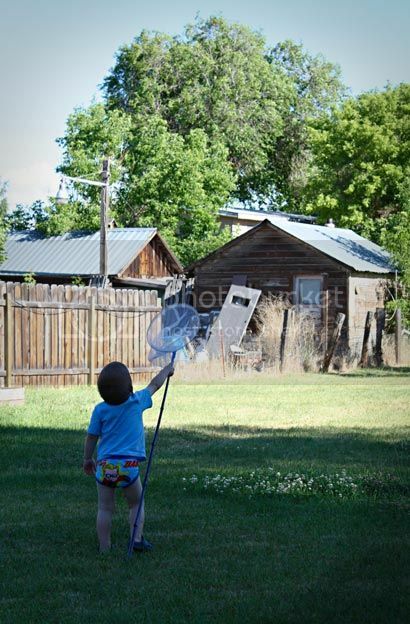 He got all excited, ran into the garage and came running out with a large butterfly net. He spent the next 20 minutes trying to "catch it." He was asking everyone "Catch it? Moon!" It was absolutely the most adorable thing. "Wow, I didn't realize you were so close to your due date, when are you due?" To which I reply-"End of September." Yes, I have gotten it all-my babies are huge people! My third was over 5 weeks early and still weighed in at 6 pounds. I always carry a ton of extra fluid too-within 2 weeks, although I may not look it, I am always back or under my pre-pregnancy weight because of this. I have gotten the looks of pity and the feet in the mouth before, but never this bad, and never this early on. It's been fun, (she says in a sarcastic tone). Just so everyone knows-this is where I am today with baby Oliver (I think we finally have settled on this name). My babies usually tend to come late-(except with number 3, who was in my opinion most definitely a stress induced premature labor)-and they come big. Thanks for your eye bulges, gasps, comments, doubts and pity...they really make a girl feel good. I know this is a couple days late, I've had doctors appointments, meetings and just plain computer laziness issues the past few days! I would much rather be sitting by the pool drinking raspberry lemonade with my swollen pregnant feet up then sitting in the house these days...but then I remember I don't have a pool, and I have to take my kids with me when we go to one...which means a whole lot of not sitting with my feet up, being served drinks by a cabana boy. This was a fun little project that I actually got done while my 2 year old was napping, and I killed 2 birds with one stone...not literally, I am not much of an animal killer unless it is an insect or rodent in my house-but that doesn't count right? My logic is, if it comes inside the house or is crawling on me or my kids bodies it wants to die. It really, truly does not want to live any longer. Otherwise I tend to leave all living things alone. We have this desk that has been seriously abused by my children. I am fine with that, it is their desk. We took out the bottom cupboard and shelf so that it could be used for their computer, but then I decided they didn't need a computer-so for quite some time it has just been an empty hole. Not a pretty picture. Speaking of not a pretty picture, they color, paint and stab the top of it on a daily basis. There is only so much a magic eraser can do children! In comes the easy, time saving, no paint fume method of covering up that problem...Shelf Paper! I always have a bunch on hand since I use it instead of vinyl for my Cricut-time saver and money saver-got to love it! I just stick it on there, add a few heavy duty staples around the edges to be sure the kids can't pull it off in the first day I give it back to them and Voila! Desktop recovered! This drawer for the keyboard has some issues, we picked this desk up off the side of the road, and whoever had it before thought that the little paper clip holder was an ash tray. Silly people. Don't worry it's been bleached and cleaned long ago! I thought about getting rid of it all together since they don't have a computer anymore, but my daughter likes to have her books on it and then pull it out-so I kept it. And slapped some more shelf paper on there just to hold it together and cover up the burn marks. Then used the product for what it was actually intended for...Mind you I could have scraped this all down, painted it super cute, maybe added a curtain or a cupboard door-but this is a desk that is bound to be abused over the next few years-I just want it to be usable. ...Until you look at the back. Yikes! Not that anyone ever saw the back-but I had a plan! First I measured the back, had my hubby cut a piece of wood that would fit it, I nailed that to the back and painted it with chalkboard paint. Then I cut a thin strip of wood and nailed that along the top to give it a more finished look. Then came the fun part. I painted that piece of wood green, and painted a white swoop across the top. ...and surprised the kids with a little Sweet Shoppe/Lemonade Stand that they can use this summer! The best part is, I don't have to worry about storing it! It is already in their schoolroom as a desk, and when it is against the wall, you wouldn't know it was anything but the desk-they can also use it in the house while playing store. Plus it took me less than a couple hours to fix up the desk and make it into something completely new. Now where is that cabana boy, I could use a foot rub, after he brings me a big drink with an umbrella in it! SO many fun and cute ideas last week! Here are a few of my faves, which were yours? Can't wait to see this weeks! The Blackberry Vine has these super cute tags to print (for Free) with a drool worthy recipe to make for a neighbor, birthday or any other time gift. I would LOVE to receive a gift like this, wouldn't you? These brownies just look so darn yummy. Head over to Just Sew Sassy for the recipe. This was news to me-did you know you can spray paint pillows? 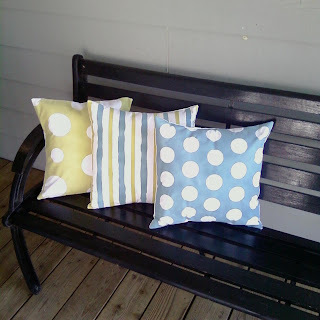 This Thrifty House has a tutorial on how to make cheap covers for your pillows-that's right those are spray painted! 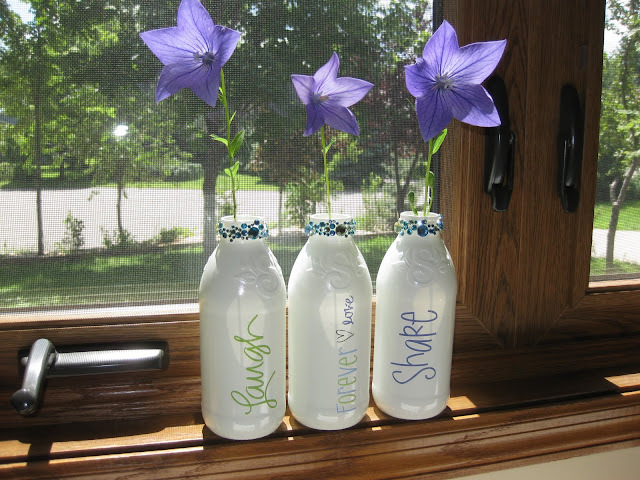 I love this post on how to make a fun soap dispenser out of a Mason Jar from Decor Chick. 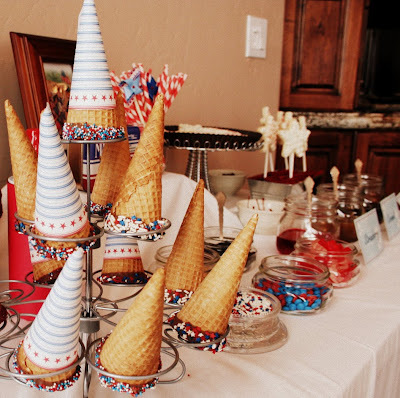 I know that everyone is featuring this post by Moore Minutes on a Retro Ice Cream bar-but I had to add it in as well-my husband and kids would be in heaven. I'm thinking of doing something like this just for a surprise family night and inviting a couple friends over in the backyard. 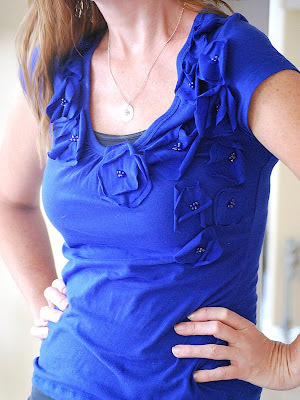 And finally this no sewing machine required shirt makeover is super cute from Jen at Tatertots & Jello. If you were featured-grab a button here.